From The Walking Dead Comic Series 4, comes a Previews Exclusive 2-Pack featuring Carl Grimes and Abraham Ford in a bloody black and white variant! Each 5-inch tall action figure comes with character-specific accessories. 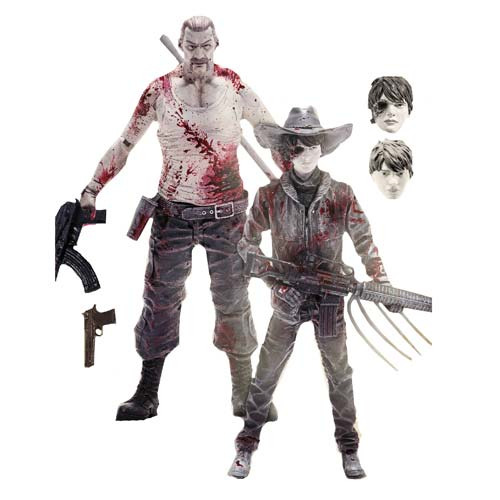 This detailed 2-pack of Carl Grimes and Abraham Ford comes in a displayable window box package. Ages 13 and up. "Love Entertainment Earth! Great service, prices and customer service! Why waste time driving around when you can just order the item(s) right from here. I've been a collector all my life and this is the way to do it now." "Love Entertainment Earth! Great service, prices and customer service! Why waste time driving around when you can just order the item(s) right from here. I've been a collector all my life and this is the way to do it..."